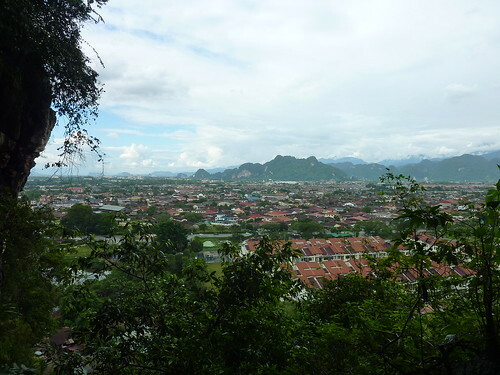 As cities go, Ipoh was pretty quiet, at least in the area we stayed. 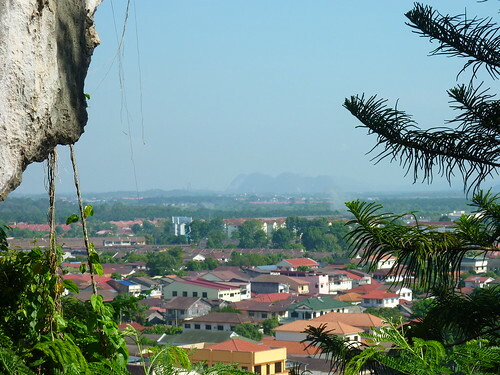 Similar to Vientiane, it seemed to be more of a business and administration stronghold, with little in the way of tourist attractions in the immediate vicinity. Luckily, there’s a fairly robust public transport system, so after checking into the Hotel Sun Golden Inn (tired decor, wonderful Chinese and Indian staff, eminently more comfortable than our last place), we had lunch at a Chinese place called “Best Restaurant” – not bad, but with a name like that, you’ll never live up to expectations – then hopped on a bus and went to the Sam Poh Tong temple. 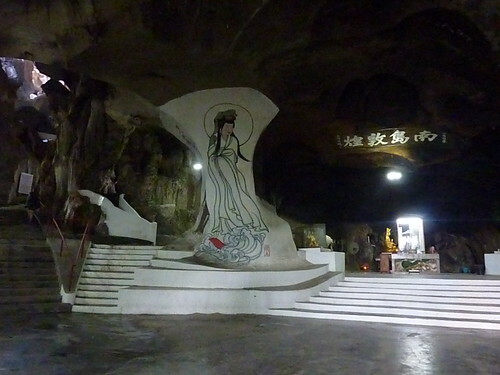 This is one of a number of “cave temples” in the area. 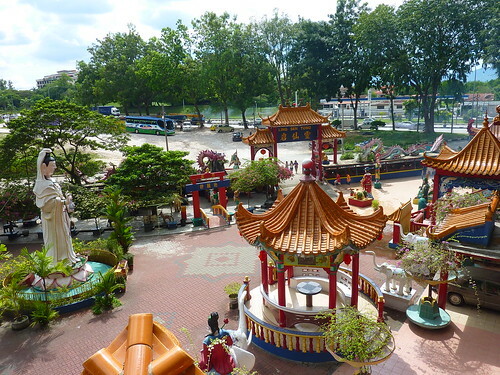 First impressions of Sam Poh Tong are not the best – it looks like a gaudy temple theme park buried in the side of a cliff. 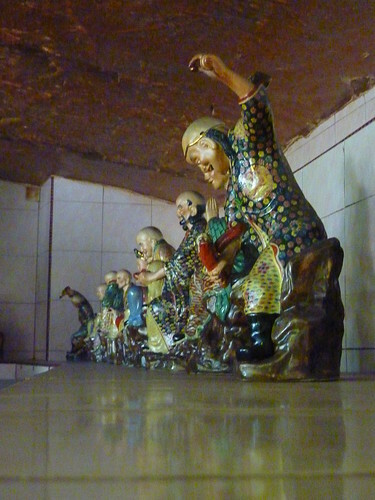 Bright coloured statues of deities and other religious iconography abound. 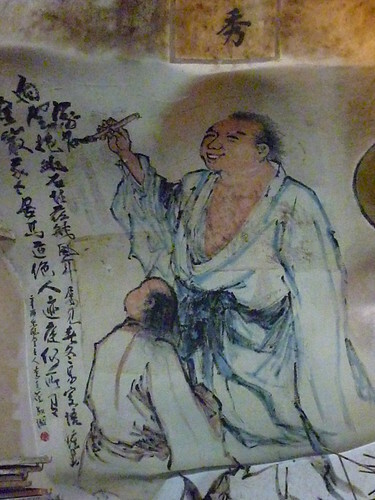 Also prevalent is incense. I say prevalent, as I have never seen so many lit incense sticks in one place since we started travelling. 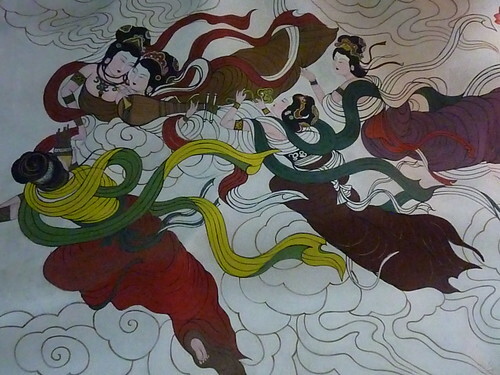 Some of the hollowed cave ceilings and walls are black from the smoke. 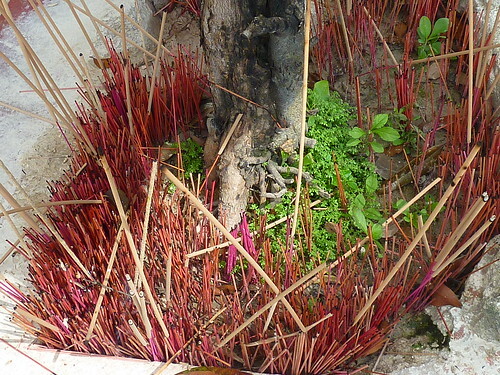 People burn huge bunches at a time and then select the pot under the god they want to appease, most of the time hedging their bets by splitting bunches of twenty into groups of four or five. Obviously you don’t want to miss a god out, as he or she may get annoyed at you and who knows when you may need a favour from them later? I managed about 20 seconds in one of these rooms before I had to leave; I literally couldn’t see, as the smoke was so intense that it temporarily blinded me. The grey hue around the light in the third photo below isn’t bad exposure, it’s incense smoke in one of the rooms I was able to stay in for a little longer. 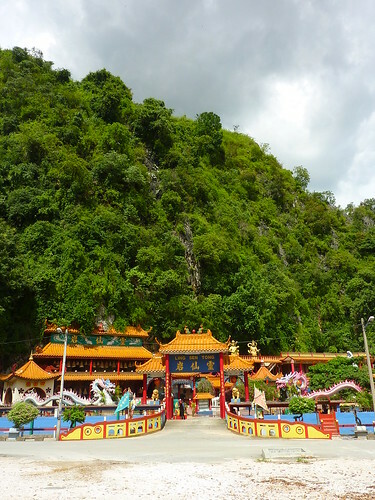 I believe it is entirely possible that this temple is single-handedly supporting the incense trade in Malaysia. 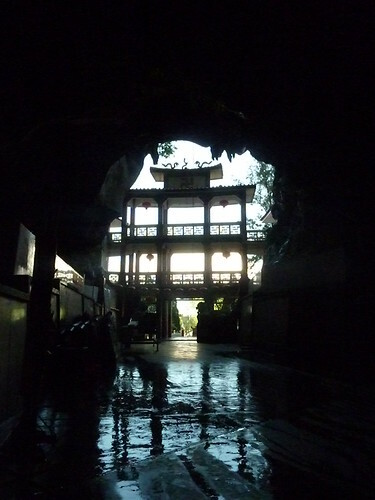 We entered the temple proper, and it was quite impressive. 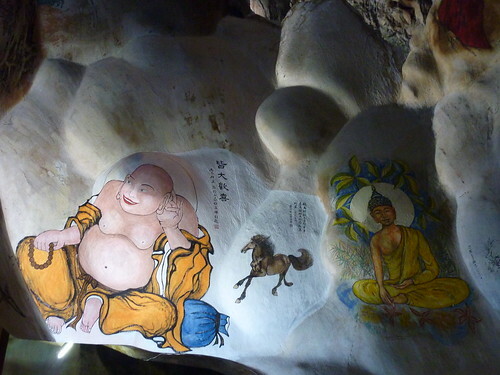 The place had been dug out of the rock, murals were daubed on many of the walls, and statues had been set in alcoves. 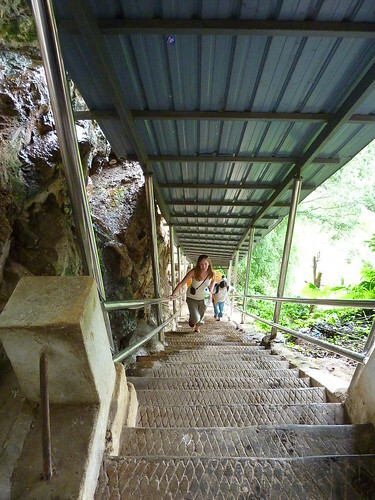 There was also a huge set of stairs to climb to get a better view from the top of the cave, which gave us a great landscape. 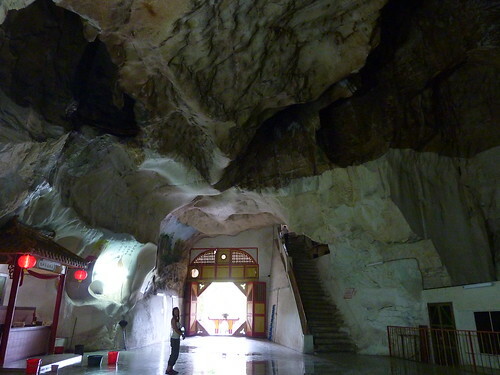 In one end of the cave at the top, there was a rainforest-like area which had been allowed to grow naturally. It was getting towards the end of the day, so we caught the bus back and went for some food at M. Salim restaurant. Malaysian cuisine is interesting. 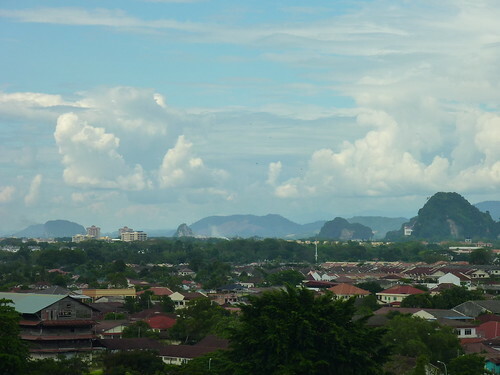 Since there are so many different cultures, which are generally contained within their own parts of any given town or city (Chinatown, Little India, etc), it’s hard to put your finger on what exactly “authentic” Malaysian food is. This one was an Indian, and I’m pretty sure we got the “western” treatment: not particularly spicy dishes, staff who took our order and then gave us an approximation of what we’d decided on, and then overcharged us. Bit of a shame, as it could have been pretty good. 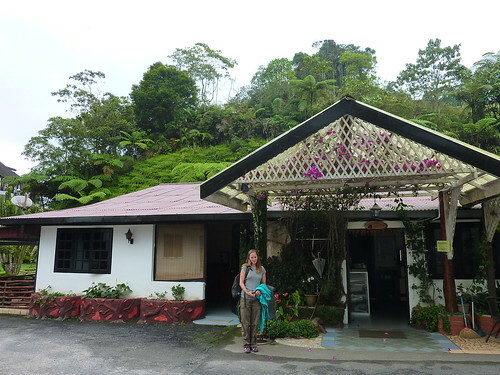 The next day we decided to tackle the other main temple cave, Perak Tong. On arrival, we were greeted by a toad. Which was nice. 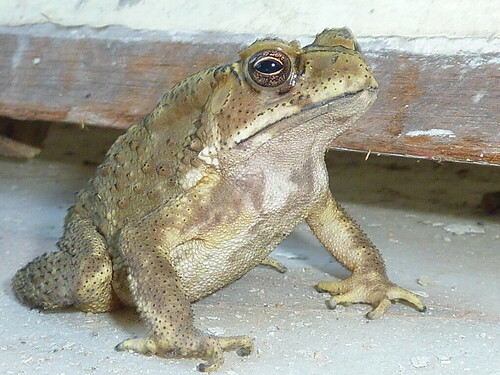 I think (s)he was trying to channel the HypnoToad, and did a pretty good job of it. 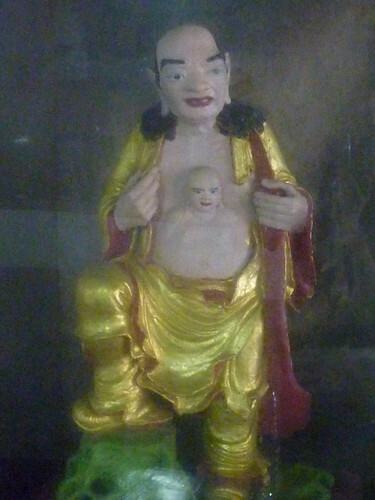 Perak Tong was a much more spacious cave temple than Sam Poh Tong, and had a variety of wall murals and drawings scattered around the ground floor, as well as more alcoves with various statues in, one of which was a bizarre Buddha with another Buddha-like figure erupting from his stomach, Total Recall-style. Climbing the stairs, the views were again impressive. 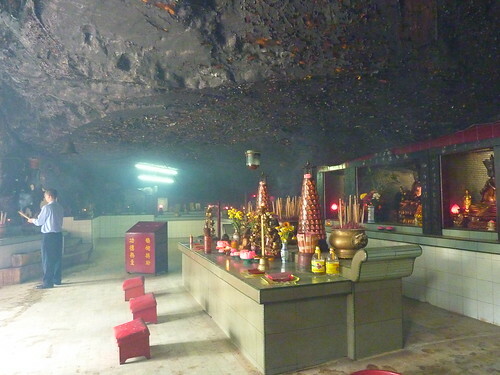 There was also far less incense burning our eyes than the previous cave. 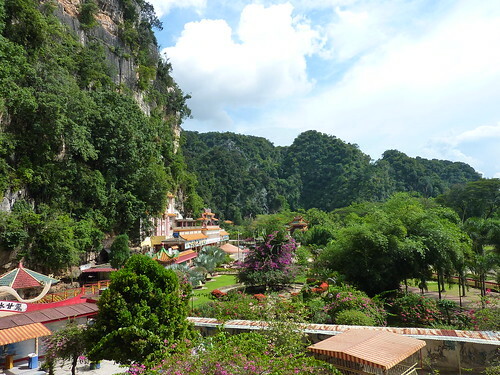 Having had our fill of temples, we decided to leave Ipoh that afternoon, our next destination being Tanah Rata in the Cameron Highlands. We jumped on a bus at the station and after a journey that took us along some very winding roads, we arrived in the late afternoon. 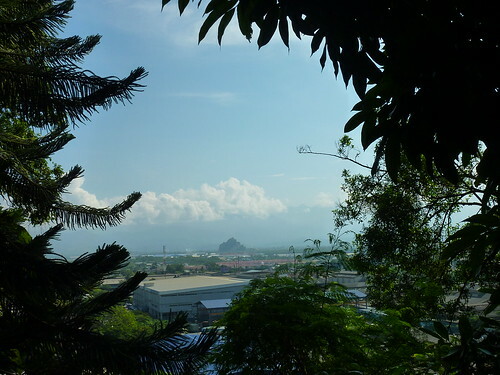 We had no accommodation booked – there was apparently an abundance of hotels and guesthouses in the town, and it only got busy during the Christmas and New Year period. On arrival we were taken to a place by a hostel tout promising cheap rooms which, after getting there, offered nothing of the sort. Thankfully, he drove us back and pointed out another guy who worked for a different place. 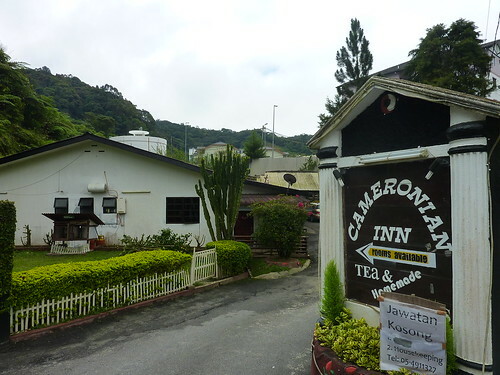 We had more luck with him, and decided to settle into the Cameronian Inn for a few days – a guesthouse which looked more like an English bed and breakfast. After getting the room, we went out for a bite to eat at Kumar’s, an Indian on the main road (there’s basically only one strip of road which is crammed full of restaurants and tour operators). It was pretty decent: for about two quid you get a tray with a naan bread, some rice, three sauces and some tandoori chicken. That was enough excitement for us for one day, so we decided to get an early night ahead of a potential trek the following day.